On the 5th of April, Sauti Sol´s Savara Mudigi left the country for Harvard University and we only expect him back in 2020. The vocalist took to social media to bid fans and followers ´goodbye´ claiming that he is in a bid to cut off probes from everyone. Reactions On his Instagram page, fans wish him well although feeling sad that he might be kept away from good music production by the books. However, it is their joy to see him seeking advancement both in his career and educational background: Lugha ya taiga will be a lit jam珞珞珞 margaret.wandia You better be stopping over to see us珞 Should we start the cooking….and the music?  Safe travel… jessiejerrie Haha One Love bro… Blessings alekeymarshal @savarafricaall the best and safe travel tabsnation Na mimi nabaki mbona lynda_akinyi This comes less that 30 days after fellow band member and guitarist, Polycarp Otieno left for Harvard too. Anyway, we do wish them well and hope this will bring in better quality and taste of music from the renowned Kenyan band. Ama vipi? 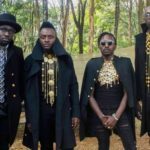 The post Another of Sauti Sol´s band member set to join Havard University appeared first on Ghafla! Kenya.